This week Quote comes from H. Jackson brown, Jr who is the author of Life’s Little Instruction Book. So you know he has alot to say and some great advise. 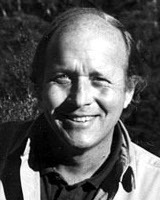 Born in Middle Tennessee (where he still lives), before becoming as a writer, Brown acted as a creative director of an advertising agency in Nashville, Tennessee. It was simple words of wisdom gathered from other people and his own experiences that made him a best-selling author. Brown first published A Father’s Book of Wisdom, which was quickly followed by P.S. I Love You, a collection of sayings and observations from his father and mother. Both were very popular and led to Life’s Little Instruction Book, which was originally written as a going-away present for his college-bound son, Adam. This book contained 511 reminders about “how to live a happy and rewarding life” and became a best-seller worldwide. It has logged more than two years on the New York Times best-seller list, including more than a year at the number one spot. Life’s Little Instruction Book was the first book to ever occupy the number one spot on the New York Times best-seller list in both paperback and hardback formats simultaneously. Live and Learn and Pass It On followed and also became a New York Times best-seller. “Live and Learn and Pass It On,” was co-authored with his wife Rosemary C. Brown, who is herself an author with books like Rosemary Brown’s Big Kitchen Instruction Book.